Me and a friend picked up a 1993 CBR600 F2 on the cheap planning to enjoy a project together. It was running when we got it but had an awful vibration above ~8k RPM. Here's our story. After that my friend put about 3000 miles and a set of new tires on the bike. He noticed the bike was burning oil. He checked the oil level and kept finding it was low and adding more oil. I don't really have an idea of how fast it was burning. Replaced the valve and the head gasket. We really screwed up here. When setting the timing this time around we were overly confident (and didn't follow the manual) about which marks had to be lined up and made a mistake. Yes it took this long for us to think "Maybe we should investigate"
Realized the mistake we made and fixed it. Instead of taking off the head to investigate we performed a leakdown test which showed <10% on all cylinders. We assumed there weren't any bent valves with these results. With the correct timing the engine started right up. There was a persistent awful rattling noise we believed to be the cam chain. We've read that the tensioners are prone to failure. After about a minute the engine warmed up and the a lot of white/gray smoke started coming out of the exhaust. It wasn't very thick and smelled burnt. We hoped was that this was residual oil and only temporary. We planned to do a carb sync, so the engine was idling for about 8 minutes before it began to run very rough. This is when we heard the worst noise ever... A metal cracking noise followed by an abrupt stopping of the engine. So we took the head back off and this is what we found. Did we mess up the valves with the bad timing? If so why did it run fine for 8 minutes? Why was the leakdown test fine? We obviously need a new head considering the gash in that valve seat. 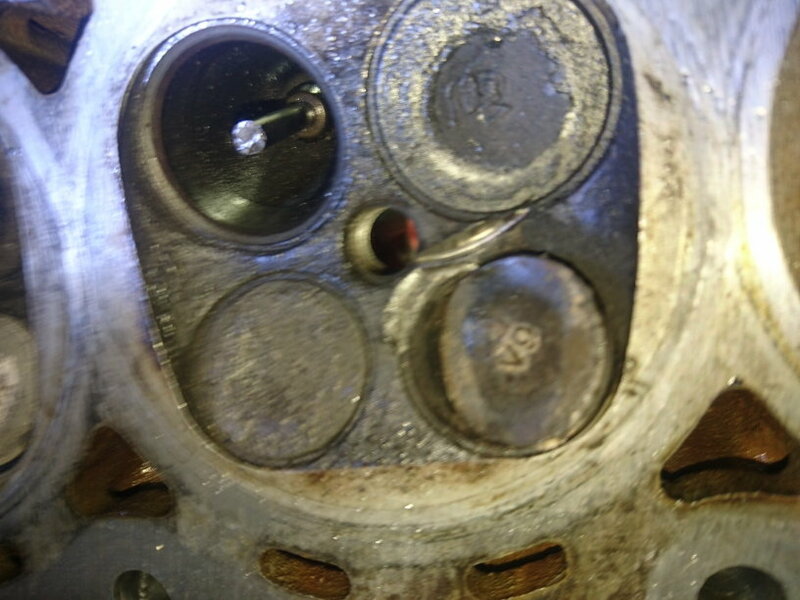 There are some gashes in the top of piston #3 but the cylinder walls seem to be undamaged. Will the new head be enough to get this running again? I've been lurking in this forum for a year and all of the information on here has been incredibly helpful! That is awesome, but not in a good way. I'm guessing when the time was off the first time, you bent a valve. Even with a bent valve the bike will still idle, but it's is stressing the valve every time it closes. Eventually (8 min in this case) the valve can stress crack and break off. And lot of bad noises and chunks. I seriously doubt this had anything to do with a camchain. Not sure how you got a good leakdown on this. You need a new head for sure. You could try smoothing out the piston face. Depends how bad it is after you clean it up. You don't want any sharp edges or you'll get detonation and could end up back at square one again. Or you could put a just swap another piston in. Also check the connecting rod to make sure it's not bent. It all just depends if this is a fun project or you want a bike to ride. 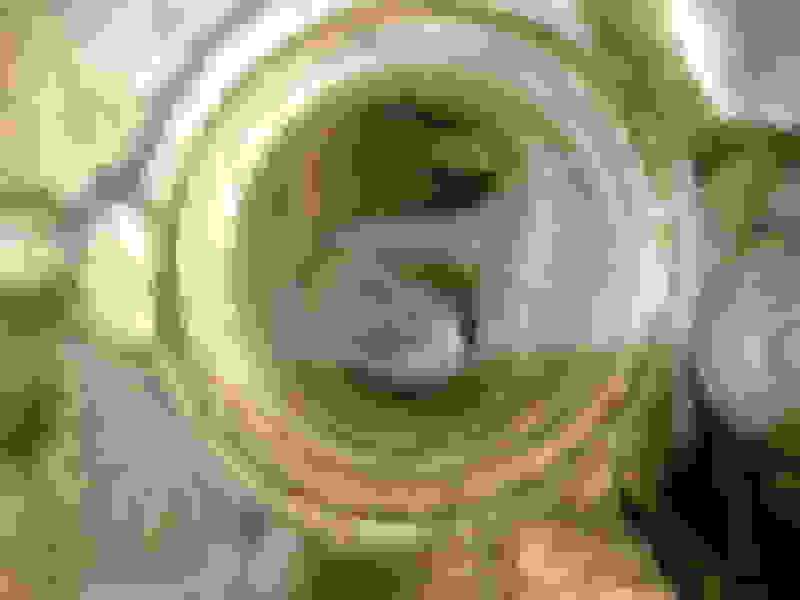 Last edited by Phil314; 06-20-2018 at 08:10 AM. I'll clean off the piston soon, try to smooth it down and post another pic. Should I be concerned about the smoke I was seeing? Could it have been oil leaking past the valves after we bent them? If it's burning oil from somewhere else i want to make sure we fix that before putting the whole thing back together. Also, how clean does the head gasket surface have to be? There were some black bits from the old gasket but they were smooth and could barely be scraped off even with a razor blade. As for the diagnosis, Phil is probably dead-on. I'd be worried about the cylinder walls. Anything that'll catch your fingernail is too deep to reuse without honing. Those metal chunks can be bad news if they get into the oil system. 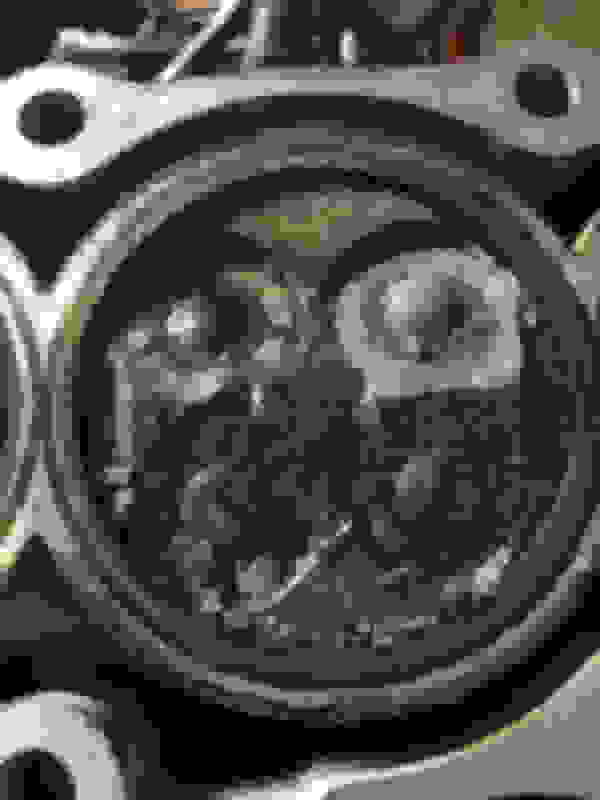 That piston looks like it's got a pretty good divet in it. That will be hard to smooth. It really boils down to if this is more of a project. Then smooth it an try it. If you're trying to fix the bike to ride, them put a new/used piston in. The smoke could be a couple things. The bike could have had previous undiagnosed problems like a cracked ring. Could have been a cracked valve guide from a bent valve letting oil drip in. Too hard to tell. Head gasket should be clean and shiney. All old bits of gasket and stuff need to be removed or you risk it leaking. Personally, I'd pull the piston, check the walls and rod. If good, I'd put a new used piston on with the old rings. Then a new head gasket and a good used head. Spec everything, check the valve clearance. Turn the engine over by hand first. Then do a compression test and if everything checks out, fire it up and run it. Thanks for the tips. I only have time to work on this on weekends so I'll take your advice and post an update in a few weeks. I wouldn't even try to save this engine. I did the same on a Toyota pickup (except for the part where it was my fault ). Lost a head gasket, damaged the head and pistons, tried to save the engine. The roughness that results from trying so "smooth" out pistons and head chambers results in significant amounts of inconsistent burning of gas inside the cylinder. The truck ran OK for about a year and then just started having problems again and I had to put in a remanufactured engine anyway. Would have been better off saving the time and money and going straight for new engine. You would not only need a new head (this one does not look rebuildable to me) but also new pistons. This becomes very expensive very quickly. I would look for a wrecked bike. Since you only need the engine and the since the engine is unlikely to have been damaged in a wreck (other than side covers which you can save from yours) you might be able to pick one up dirt cheap. I got one for $150 a year or so ago. PS Don't feel too bad. As mentioned by tentacleslap this is part of the learning process. I've screwed up my fair share of stuff over the years, but eventually it led me to become a professional Harley mechanic and I think I've done well. So long as you learn from each screwup. The hard lessons are the best learned. I think you bent a valve right away and things went downhill from there. If you just want to get going again, buying an engine from a reputable seller is the way to go. The cost will likely be lower than what you'll spend fixing what you have, especially if you do it correctly. Besides, an engine is pretty cheap when you don't need the starter, alternator, etc. You'll be able to re-use that stuff. If what you want is to build an engine (way cool) then do it properly, hopefully with the help of someone who's done it before. You'll also need a machinist. You can get someone local or ship it to a place like Power Seal (the place I use). I had a race engine die on me where the damage was nearly identical to yours. 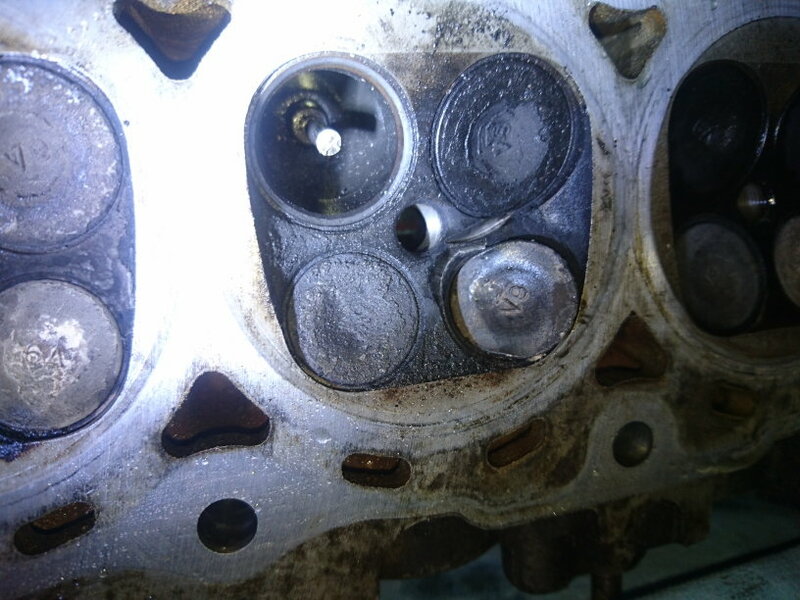 The top of the exhaust valve broke off and stood on edge which drove it into top of the Piston as well as trashing the cylinder. In the end it with was a head, valves and valve job, new piston and a bore. This was on a two-valve single and I was in it for a few hundred dollars, so you can multiply that by at least four. Last edited by Commander_Chaos; 12-15-2018 at 05:58 PM. We decided to get a new (used) engine from ebay for about $600. We've put a few thousand miles on it since then and it's still going strong. It has been a great learning experience and I definitely won't hesitate to get into another engine in the future. Thanks for all the advice everyone! Everyone of ya'll should be ashamed of ourselves! Anyone mess with your bike?